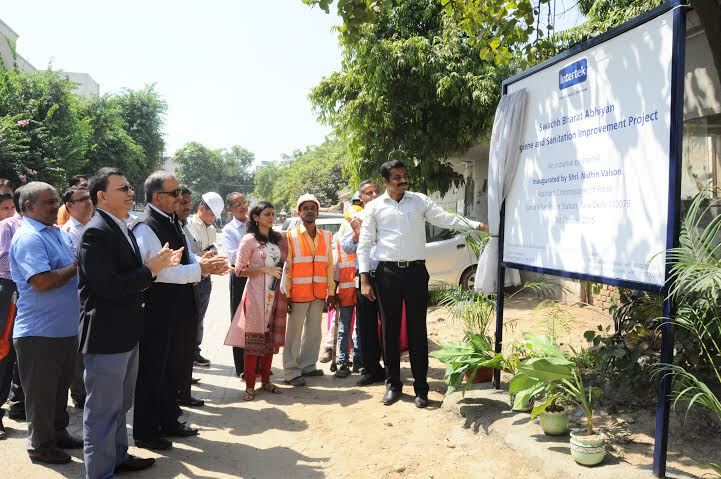 Intertek, a leading quality solution provider to industries worldwide, inaugurated its new project on the occasion of the first anniversary of the Swachh Bharat initiative. Recognizing its role and commitment toward the society, Intertek undertook this initiative to enhance general hygiene and sanitation of the Mohan Co-operative area as part of the Swachh Bharat Abhiyan. Mr. Nidhin Valson, Assistant Commissioner of Police, South East Delhi in the presence of Mr. Anil Kumar, Chairman and Mr. Rajesh Saigal, Regional Managing Director South Asia Intertek, inaugurated the initiative. The Mohan co-operative area consists of slum clusters that lack sanitation facilities and suffer in terms of health and quality of the environment. The initiative comprised of activities including maintenance/provision of adequate drainage system to promote sanitation, filling of the pot holes to avoid water borne diseases, ensuring regular cleanliness of the area and promoting a green environment by regular upkeep of plantation activities.